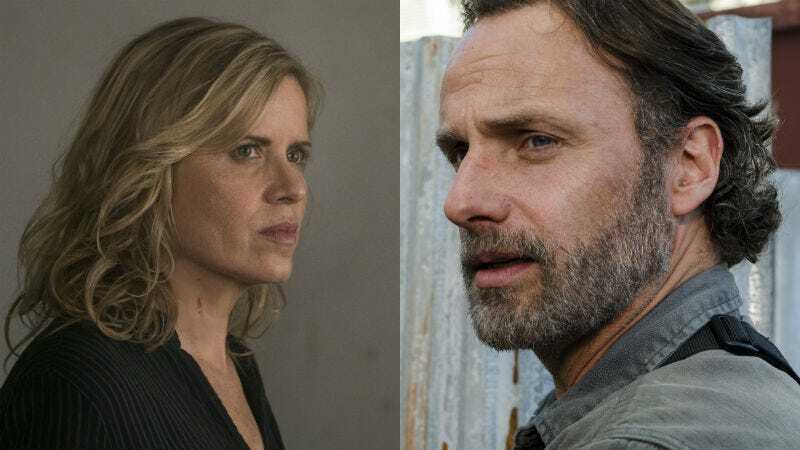 With Fear the Walking Dead finishing one season and The Walking Dead about to start another, it’s the perfect time to talk crossover. Abraham is dead on the main show. Before appearing on the main show, we know Abraham was in Houston, Texas. Houston was recently been mentioned on Fear the Walking Dead, and is one of, if not the, most westerly origin points revealed for any character on the main show. (Fear the Walking Dead is in the Southwest, Walking Dead is in the Southeast). Actor Michael Cudlitz seems to be teasing it on Twitter. So yeah, that’s probably it. But that’s no fun. Below, we’d love for you to post your dream crossover. Who is a character you’d love to see on which show and why? I’ll start. Now, this is highly unlikely for a bunch of reasons, but we’re dreaming big, right? I’d go simple. I’d like to see Madison from Fear the Walking Dead as a member of Negan’s Saviors. No big backstory. No explanation. Just Madison, the main character of Fear the Walking Dead, somehow surviving years into the future and running around with Negan. Sure, that would mean she’d have to survive the entirety of that show, but it would change so much. Knowing that she had to survive, travel all that way, and work her way into that group would be a great endpoint for Fear. There would also be the questions of what happened to everyone else. Are they dead? Did they leave her? Dis she leave them? It would be a huge Pandora’s Box of cool questions. It’ll never happen, but it would be fun. Now, your turn.